By the solemn Act of Union between the two Grand Lodges of Free-Masons of England in December 1813, it was 'declared and pronounced that pure Antient Masonry consist of three degrees and no more, viz., those of the Entered Apprentice, the Fellow Craft, and the Master Mason, including the Supreme Order of the Holy Royal Arch'. Considered to be the completion of the Master Mason's degree, Vernon Lodge has close ties to the Holy Royal Arch Chapter which bears its name and number. Membership is open to all Master Masons from recognised Constitutions, enquiries can be made through our Contact Us form. 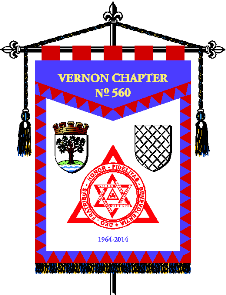 The Vernon Chapter was Consecrated on 14th November 1964 and meets on the third Friday of September, November, January and March. The annual Installation of the Principals takes places at the September meeting. Vernon Chapter No. 560 celebrated the 50th Jubilee of the Consecration in November 2014 with a dedication of a new Banner. The first Chapter banner in the province of Worcestershire.